The European Commission is scaling up its response to an unprecedented cholera outbreak in Yemen with an additional €5 million, bringing total EU support for efforts to tackle the disease to €8.8 million, the Commission announced Friday. “The cholera outbreak in Yemen continues to spread dramatically during the last weeks and warrants urgent action. The European Union is stepping up support to allow humanitarian partners to rapidly increase their capacity to treat people and save lives in Yemen,” Commissioner for Humanitarian Aid and Crisis Management, Christos Stylianides said, underlining that “only a political solution will bring this catastrophe to an end”. The Commissioner also stressed the need to grant humanitarian organizations full access to do their life-saving job. 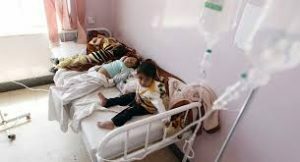 The disease has rapidly spread to 20 of Yemen’s 22 governorates and has killed over 1000 people in the last eight weeks. Suspected cases of cholera increase by the day in the thousands and nearly 170 000 people have been affected so far. The EU aid will support the United Nations cholera response plan, which includes health treatment of cholera cases and preventive measures providing safe water and improved sanitation in high priority areas. The Commission’s overall humanitarian funding for Yemen in 2017 stands at €121.7 million, the Commission recalled. Humanitarian organizations estimate that 18.8 million people (almost 70% of the total population) are in need of humanitarian assistance. Written by: Peter Mulvany on June 24, 2017. Last revised by: Jaber Ali, our reviewer, on June 25, 2017. Posted by Peter Mulvany on Jun 24 2017. Filed under Gulf News, Headlines. You can follow any responses to this entry through the RSS 2.0. Both comments and pings are currently closed.